This lightweight Sparkle Backpack is a must have to get you through the rigors of school and traveling on the road in style. This stylish pack features padded shoulder straps, 4 compartments, and a mesh side pocket for your water bottle. 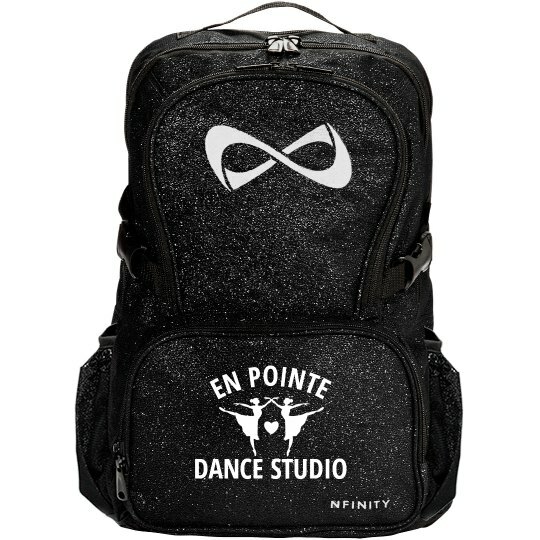 Nfinity is the top brand right now for sporty backpacks. Throughout the body of bag is a metallic glitter knit thread. Support your local dance studio by sporting their name on this sparkly backpack! Change the text to where you take lessons and it will go perfectly with the dancing ballet heart design. Show off your sparkle with this custom bag today!